In an effort to stay on top of our chore list, we took down all the Christmas decorations on Saturday. A little sorry to say good bye to them so soon but it was time for them to be packed away until next December. You know how fast the years seem to fly so it won't be long before I see them again. Mr. Limestone scored some great holiday storage boxes at Home Depot for 75% off. Everything got packed away carefully in paper before going into these fun little bins. Can you believe all but two (especially large) balls fit perfectly into this container? They didn't have those little sections inside which turned out to be a good thing because I could fit so much more in it by nestling pieces together snugly. Definitely recommend using these. I also took down our holiday cards. I decided that since so many of the cards we receive now have photos, artwork or personal notes from our friends, I just have to keep them. So from now on, I'll keeping a little bundle of my favorite greetings tucked away with the ornaments. I think it will be a lot of fun opening these up in 10 years time. After that was done, I scratched the surface of miscellaneous junk that is also known 'round these parts as the "box room". Im pretty good at giving or throwing things I don't use away. But there are some items in here I just can't part with. While most of the items are being kept with a specific purpose in mind, some things just defy logic. Like 3 years worth of Martha Stewart magazines. Am I really going to spend a week pouring over old issues? Doubtful. But I can't throw them out because I know some fabulous ideas Ive forgotten about are lingering inside. This photo was taken before 15 or so boxes from the basement got added on top of what you see here! I have some plans for this room for the coming year so stay tuned! If you've come to check who won the little New Year's gift, please check back later this week. I may have more than one winner! You are well organized and that pays off when you once again need to put your finger on these items next Christmas. I have enjoyed your site and love the accomplishments in your ever so lovely home. I am also doing a purge of things that are taking up space. Things that I no longer use or need. I had that problem with old magazines. So, I bought a big binder and some page protectors. I cut out all the things that I liked and made little sections in my binder for decorating,holidays, entertaining, etc. It works real well.  Did mr. limestone get the boxes recently? 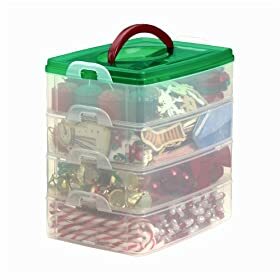 I need to send my Jeremy out for some of those...I hate having to save each ratty box the ornaments came in...but I can't justify the expense of a ten dollar storage bin (maybe I am being too cheap)...but 75% off?!?! That is great! Yes, he got them this weekend...but they were probably about $10 for 2. They were originally $20 each! Oh, the familiar dilemma. Our renovation has meant getting rid of many unwanted, but perpetually stored things. But magazines--you've put your finger on it--it's hard to part with something that might contain some forgotten but brilliant idea or bit of reference. A box room. What a nice name. Our basement is the "box room" of our house. I am pretty good at decluttering too, but there is so much random stuff that it's hard to part with. I really hate clutter but find I am ankle deep in it half the time. P.S. That is the prettiest junk room I've ever seen. Those storage bins are great! I am so excited I found your blog and can't wait to see your progress this year! Oh my, I had the same parting problems with my Martha Stewart Living collection. But then I realized there were truly only about 5 pages out of every magazine that I was keeping them for. So I spent some time flipping through each of them again (it was fun remembering the ideas that had once inspired me) and ripped out the pages I wanted to keep. It was such a little amount that I just slipped them into a manila folder (for now). It went from a huge pile of magazines to one tiny folder. I highly recommend it! I love your new header as well! Good luck with all those boxes. eeek. i also condense my Living's into a binder. As I read each issue, i rip out the articles and ideas i like and put them into a binder sorted by holiday, floral arrangements, etc. I also have a separate binder for all the good things. Hi there. It's time to purchase a Christmastree... Well for me it is, and I was wondering about yours. What brand and model do you have. It just looks so real. I've been looking around Balsam Hill, but unfortunately they don't send to Norway. We just don't have this kind of threes here. Mine is ok, but I'd really love a more real looking one. Hi Laila - Im sorry, I threw away the box so I don't remember the brand. If I recall, its made by GE. Really the only thing I was paying attention to was that it had 1500 lights when most of the other trees I had seen had less than 1000. Sorry I can't be of more help! I'm really enjoying your blog, I love seeing how people in different parts of the country are living and decorating!